DUMBARTON earned plaudits but not points against Ladbrokes Championship leaders Hibs at Easter Road. DUMBARTON earned plaudits but not points against Ladbrokes Championship leaders Hibs at Easter Road in front of a 13,881 crowd. After their shock Scottish Cup defeat at home to junior side Bonnyrigg Rose in midweek, Stevie Aitken's men had a lot to prove. They proved they could play at this level but are still impotent in front of goal. Sons started well, claiming the majority of possession in the first 20 minutes and pressing forward. Hibs, meanwhile, had two attacks which petered out without danger. On 24 minutes the home side claimed their first corner, resulting in a Brian Graham header which catapulted wide. From that point on Hibs applied wave after wave of pressure on the Dumbarton back line, finally gaining the lead just before the break as Paul Hanlon stole in on the blind side from a corner to strike home. Both sides had chances in the first 25 minutes of a tough and competitive second half. But once again a strong Hibernian team began to exert control, having a Jason Cummings goal disallowed for offside on 69 minutes. On 76 minutes the Easter Road men effectively sealed victory when Brian Graham found space in the 18-yard box to bring the ball down and volley past Alan Martin for a 2-0 lead. Sons managed to shore things up in the closing stages, but could not find a way of breaking back. 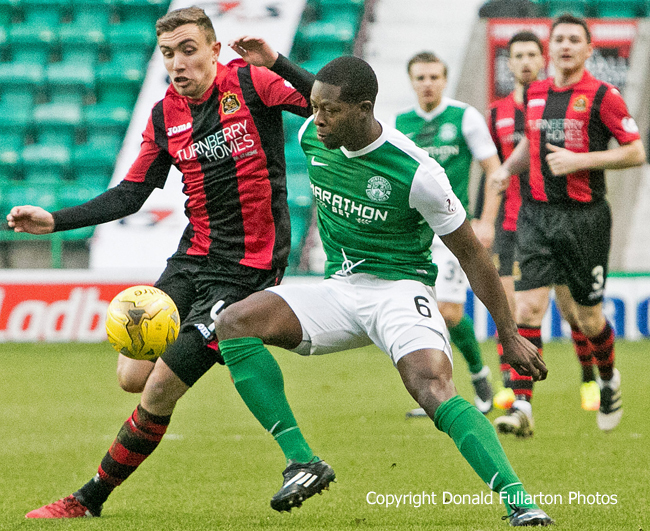 The picture shows Joe Thomson tangling with Marvin Bartley.